There are so many things to like about fall, it’s hard to know where to start – the crisp days, apple picking, hayrides, pumpkin lattes (or pumpkin anything really), or the color show that Mother Nature gives us. But the thing I like the best is the knitting and crocheting. Fall is the perfect time of year to cozy up with our needles or hooks and get to work making things that will keep us and/or our loved ones warm during the winter months. 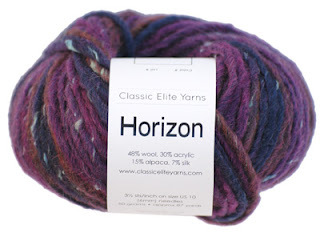 Horizon is one of our new yarns this season and it screams fall to me. It is a bulky single that has a subtle stripe to it and flecks of silk to give a tweedy feeling. And it is super soft to boot! It comes in 10 fabulous colors that are sure to get your imagination going. It makes awesome accessories and snuggly sweaters and throws. Cheryl, who works in our outlet store, couldn't wait for the cooler weather to knit with the Horizon, she loved it that much. 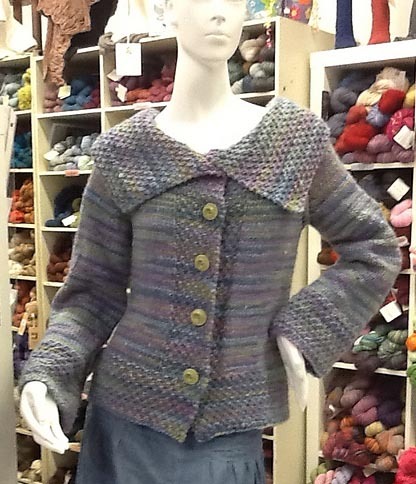 She cast on the Honovi sweater in the 7920 Pearl color as soon as it was available. Honovi is a top-down sweater starting with the collar in a moss stitch pattern. Cheryl is a super-fast knitter and within a day she had the collar done. In fact, it only took her about a week to make the whole sweater. (The big needles help – it normally takes her about 2 and half weeks to make a sweater.) The best part of this sweater? Once you are done with the knitting, all you have to do is weave in your ends and sew on the buttons (Cheryl had sewn on hers before she finished knitting the sleeves). The only down side of her finishing this sweater already is that it is still a little too warm to wear. The Farmer’s Almanac says we are going to have a cold winter here in New England. I guess she is one step ahead of the rest of us! Check out some of our other designs in Horizon here. Gauge, Part 2: Swatching and Measuring! Gauge, Part 1: What is it?